Thomas Bramley produced postcards of all the Bailiwick and was based in Guernsey. Bramley's arrival date from England and the start of his postcard production is not known by the author, but it has been verified that he produced a Guernsey postcard in 1908 showing the departure of the Lieutenant Governor Major General Campbell C.V.O, CB. in that year. Conflicting dates for the end of production have been given as 1927 to the 1930's - further research is required. He operated from 71 Mount Durand and then went to Hiawatha, St Julian's Avenue; a property that has now been demolished. A date of arrival at 'Hiawatha' is also not known, but a date of 22nd March 1916 on a postcard the author has seen says he is based at 'Avenue St Julian Guernsey' - a date of 1914 giving the Mount Durand address has also been seen, so the date of move is between 1914 and March 1916. 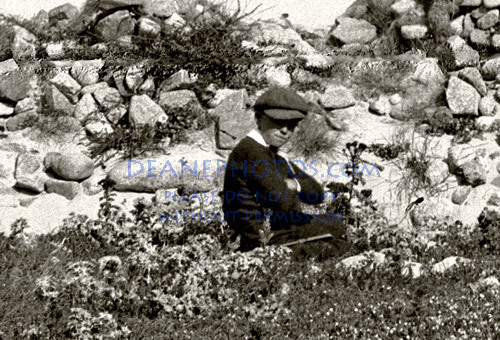 He took photos in Alderney during the 1920's and maybe in the 30's. The author has in his collection some glass negative plates that have yet to be proved are Bramleys - help with this would be appreciated once they are online. It also has to be remembered that most photographers take more than one shot in a particular location, and it is only after the film has been developed and studied that the best image of the batch will be used for production. it is therefore not inconceivable that similar shots exist that did not make it the the postcard production stage. Does anyone know who this boy was?